Nest has been absorbed by Google's hardware team, but that hasn't slowed it down. The previously announced Assistant integration for the Cam IQ is rolling out today, and that's not all. Nest has also announced a number of improvements to Nest Aware, including a cheaper plan option. We already knew that Google Assistant was coming to the Cam IQ, but it'd be understandable if you forgot. Nest announced that way back in September. This is not Assistant integration in the traditional sense, where you can issue commands to a camera via Assistant. The Cam IQ can actually run Google Assistant. If you choose to opt into the new update, the Cam IQ essentially becomes a Google Home. You can control your Nest devices via the Cam IQ of course, but it also has most of the other Google Assistant features (audio streaming isn't supported). In addition to Assistant, Nest is making some changes to Nest Aware. Subscribers will now have person alerts in activity zones. The Cam IQ also gains the ability to merge duplicate familiar faces in your photo collection. Nest Aware is getting more affordable as well. The $10/10-day and $30/30-day monthly plans are still available, but there's a new cheaper tier. For $5 per month, your camera will save video to the cloud for five days. One of the best things about Nest products is that they continue to get better through over-the-air software updates. So we’re excited to give customers the ability to add the Google Assistant to Nest Cam IQ indoor, more intelligent activity zones to Nest Aware, and more flexibility with a 5-day Nest Aware subscription plan. The security camera that’s also your personal assistant. Nest Cam IQ is the first security camera to have the Google Assistant built in – available via a free software update for all current and new customers. It’s already a best-in-class security camera with top-of-its-class smarts. 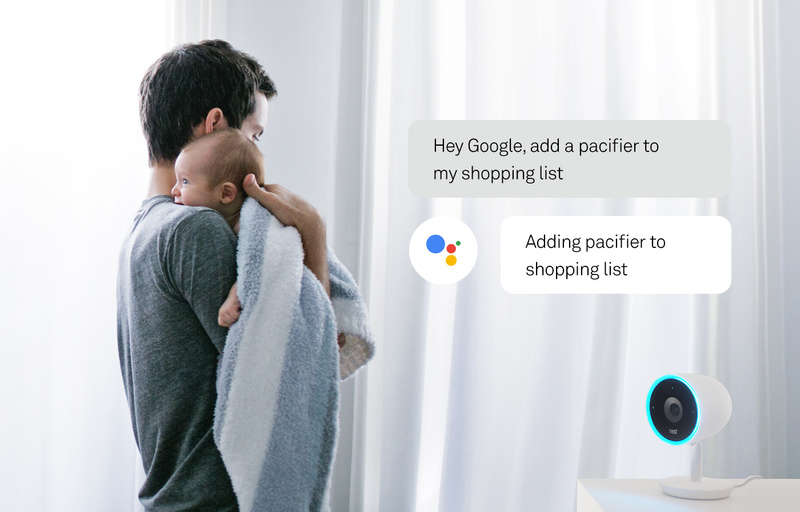 And the Google Assistant will add a whole new level of intelligence by helping answer questions, control your home, and manage tasks. To launch the Google Assistant on your Nest Cam IQ indoor, just say “OK Google” followed by your query or command. So you can raise the temperature on your Nest thermostat by saying “OK Google, make it warmer.” Or ask your Assistant to create calendar appointments and reminders. The Google Assistant will be available as part of a Nest app update starting today. Find out more here. We’re also making updates to Nest Aware, the subscription service that gives your Nest Cam smarter alerts and 24/7 continuous video recording, so you can scan through your video history and see what you missed. Now we’re adding a 5-day plan for $5 a month, in addition to our existing 10-day/$10 and 30-day/$30 plans. Nest Aware customers also have access to two new features. Person alerts can now tell the difference between a person and a thing in your Activity Zones. And if you have a Nest Cam IQ indoor or outdoor camera, Nest Aware will now be able to merge duplicate familiar faces of the same person within your photo collections. So don’t miss those important moments. With more flexible options and precise, effortless monitoring, keeping track of what’s up at home — and what went down — has never been easier.